April 17, 2017 0 comments on "Removing Hard Water Stains in Sinks"
Q: Does anyone have any ideas for removing hard water stains in sinks? My bathroom sink has some stubborn hard water stains I just can’t seem to get out! Tip #1: Try a cleaner called The Works. It’s pretty cheap and Wal-Mart carries it. They make, both a toilet bowl cleaner, and a basin, tub and tile cleaner in a spray bottle. Hope this helps! 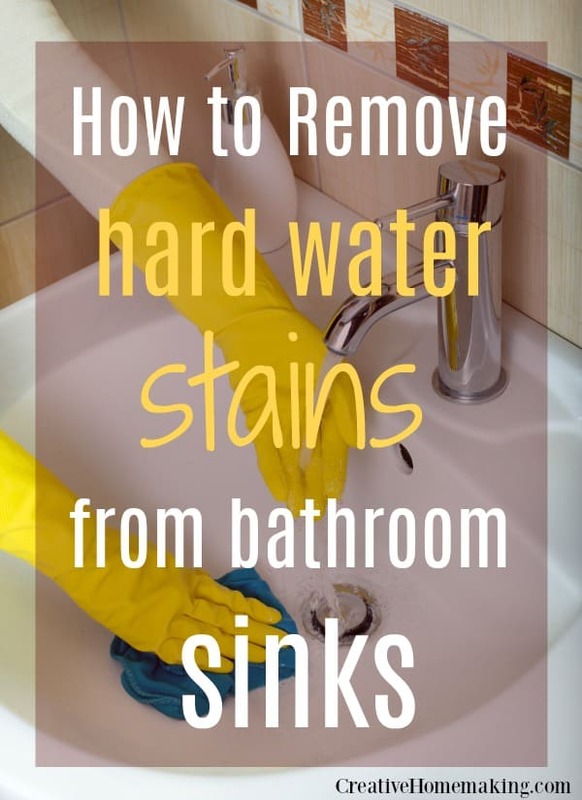 Tip #2: To get rid of hard water stains in sinks and toilet bowls use straight white vinegar. It works. It may have to soak, but works great. Also using white vinegar in the dishwasher keeps the white residue off dishes. Tip #3: I’ve used Bar Keeper’s friend. Works well…only problem if you use it “too much” or let it sit too long then it may take the varnish off around the hole in the sink. Tip #4: The Works is a great product to use to clean rust and lime deposits. To prevent them, believe it or not, WD 40 is the thing to use. Sure, it doesn’t smell that good, but smell goes away quickly. 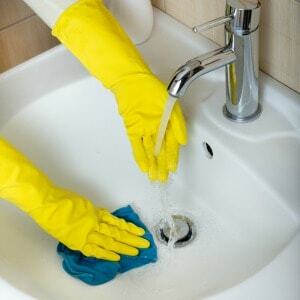 After wiping/buffing, I spray more on the old wash cloth & wipe the sink & faucets down after night-time use. Makes any stainless look almost new. I was amazed at my 43 yr. old sink looking “new”. Also great for tile shower stalls. Just be sure to buff after. I do mine every 3-4 mos. Baby oil leaves a residue. Read the WD 40 can. Tip #5: Lemi Shine is GREAT for taking off any kind of mineral buildup. Also, there are no chemicals (it is all natural). It even takes off iron stains. Tip #6: Make a paste out of Tang instant breakfast drink, and water, using a scouring pad scrub the spots in the sink. You can also get rid of the rust “hard water” build up in your dishwasher using Tang. Just fill the detergent compartments with Tang and run it through its cycle. Tip #7: I used to work for a cleaning service and we used CLR and a toothbrush. It worked really well. I use it all the time. Tip #8: I love vinegar and baking soda…they in combination or separate can clean about anything. Soap scum & hard water spots on the tub and shower stall? Soak a sponge in full strength vinegar, wipe, let stand for five minutes then rinse with clean water. Tip #9: The best thing to get rid of hard water stains is a plain old pumice stone and a little elbow grease. Not the pumice stone you would buy to slough off dead skin, but this pumice stone is usually in the cleaning aisle next to sponges. It’s a great way to get rid of hard water or rust stains without all the strong chemicals.